There used to be a sort of directory tree that would tell you where you where browsing. 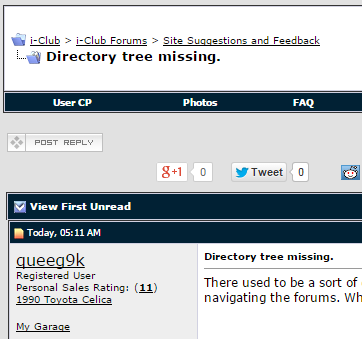 It was right below the drop down menus and you could click on any part of it to return to that level of the forums. Its gone now, I found it quite useful in navigating the forums. Where did it go? I have turned off all my ad blockers and it is still missing. Grumble. It switched me over to New_i-club and it was missing. All is well back on iclub37. What theme are you viewing under Jourdan? and there are two log in boxes on the home screen. This site is such **** now man. I dont understand why they keep "improving" it when there's nothing wrong with the way it is. Figuring out more ways to sell users info. Have you ever looked at all the trackers and **** this site uses? I would really recommend using something like Ghostery for this site. They want to get onto new_iclub because it can track you across multiple platforms/ip addresses. I'm on ICLUB37 and I haven't had any problems with it trying to switch. I do keep getting reverted to the ****ty mobile theme when I'm on my phone though. That is super annoying. I for one love how advanced the new layout is. Much better. Such improvement. Sunday drive, 12/1 "Drive through Tree"
Quick Reply: Directory tree missing.